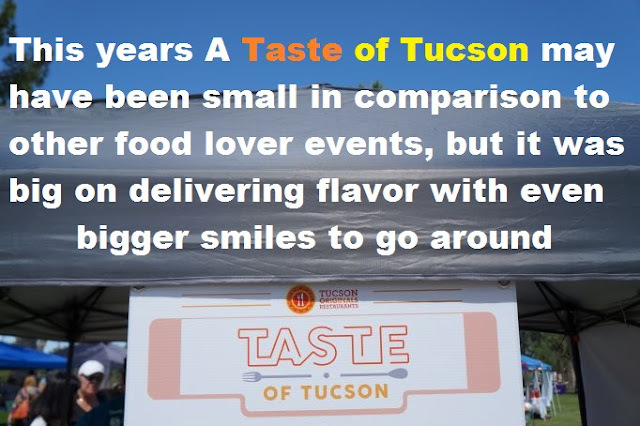 We didn't go to last year's Taste of Tucson because, if memory serves us, it was raining pretty hard. Sure that hasn't kept us from eating (almost) free vittles in the past, but that particular day was like sheets of heavy late summer drops falling in droves. Taste of Tucson is an open air event and we didn't want our sliders and samples of pizza and pasta to get soggy so we skipped out, found a dark bar and waited for the weather to get sunny. This year though? Oh man, the day was like out of a tourist brochure for visiting Tucson. 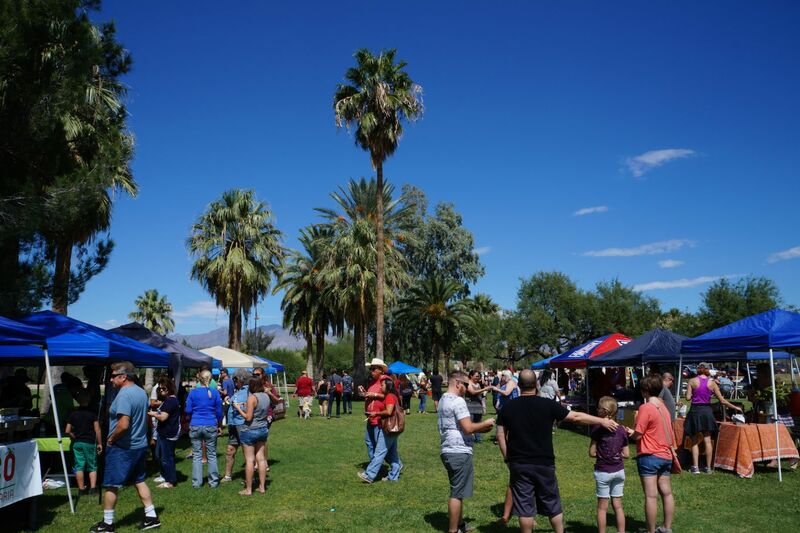 Hardly any clouds, temps in the low '80s, a light breeze, people waving to their neighbors, the beer flowed like wine, dogs and cats living together...wait. But, yes, it was nice out. Really nice. Because of the near perfect weather out our stomachs began to giggle with glee, so we lit out to Reid Park to get a taste of what this fine azz city has to offer up. Well, at least a dozen or so restaurants at least. Armed with a bushel of food tickets, we made our way down the line of food vendors and sampled til we couldn't food sample no more. If you haven't been to the Dakota Cafe, well....you need to. 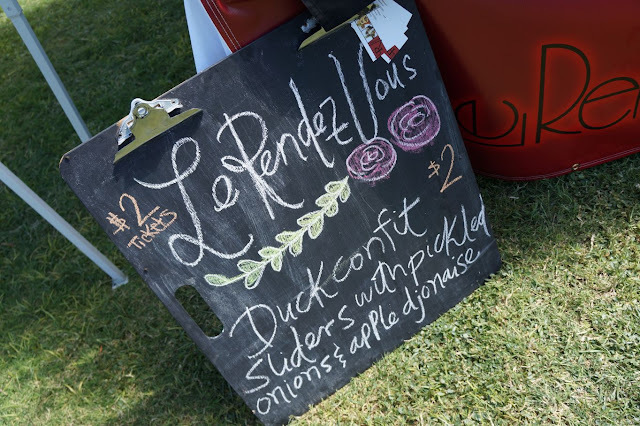 Really fresh food, delightful appetizers that wont sink your gut and all of the fare is priced to invite everyone to try their wares. What we love is their Beer Garten. Always inventive and daring, their rotation of beers on tap never cease to amaze and their take on the Sonoran hot dog, as a bar bite, is really good. 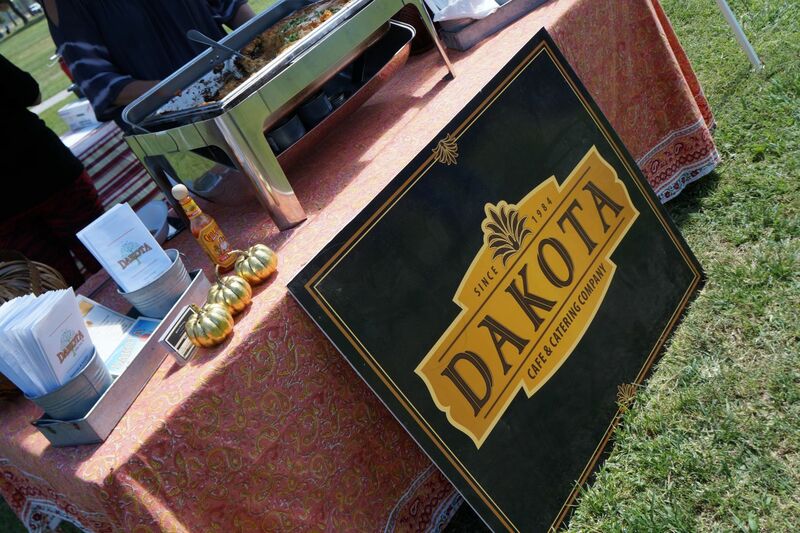 In fact, everything at Dakota is good. 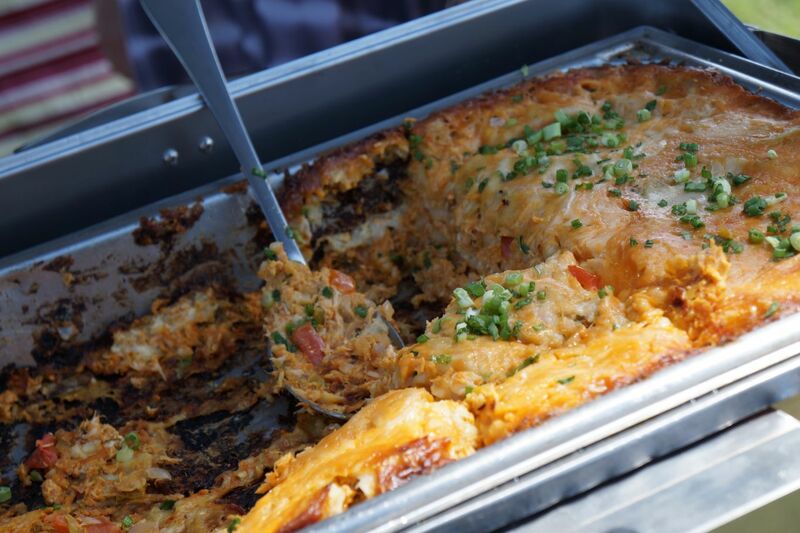 For the Taste of Tucson event, they were serving up a rich and cheesy enchilada casserole that was jam packed with layers of Tucson inspired flavor. For our first bite this one really kicked things off for us. In fact, it almost made us full. But we were happy to see the nice folks at Dakota Cafe out and dishing out the goods, but it was time to move on to the delectable delight. 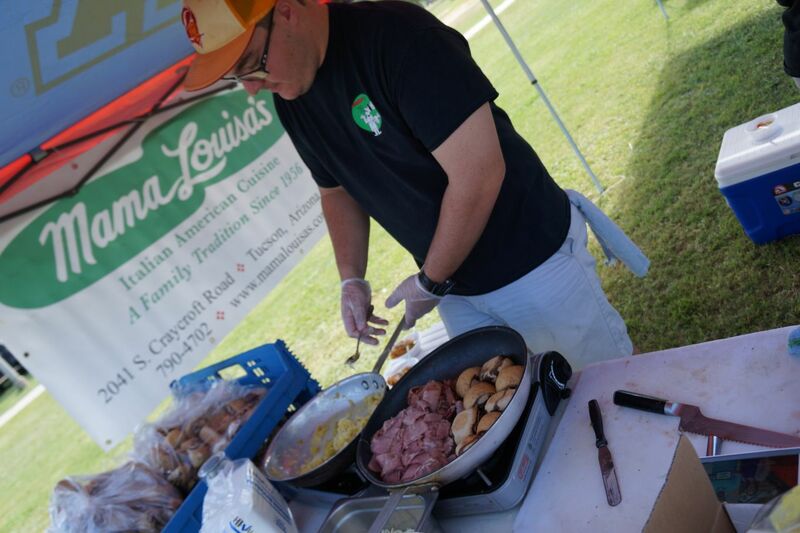 Mama Louisa's Italian Restaurant has been a Tucson tradition since 1956 and, you know what?, we have never been. Nope. Sorry. 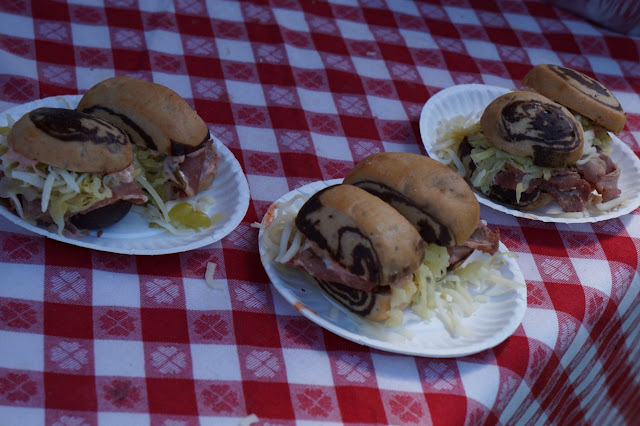 Kind of out of the way for us, being out on Craycroft and all, and our home base is definitely midtown, but after eating their divine ham and slaw sliders, we will definitely make our way out there someday for a heaping plate of their homemade pastas, sauces and Italian inspired food. Plus we heard that their cocktail lounge hasn't changed much since the early days of being in business and we like old creaky saloons that serve up an honest drink. 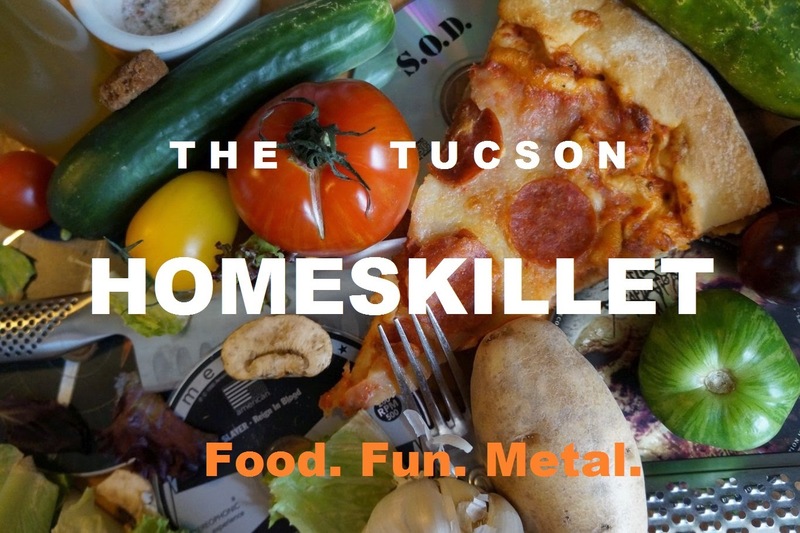 So just FYI Mama Louisa's, the Tucson Homeskillet is gearing up to make the trek out to you and eat and drink ourselves into a spaghetti and meatballs haze. Hope you're ready for us. Man those sliders were good. Not being a huge fan of regional French cuisine, the only reason we went to Le Rendez Vous is because it is literally next door to our favorite bar. It was lunch so we had their croque monsieur and their steak frites and were happy to discover that we actually dug their food. At least their lunch items anyway. That being said we told ourselves we would go back for dinner some night but have yet to. 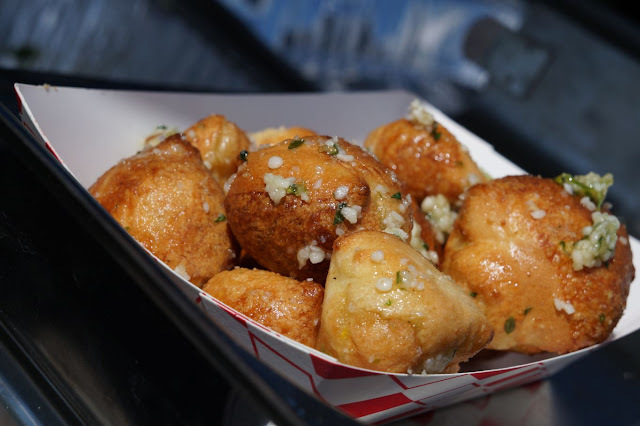 Our turn of trying out new food trucks, tiny taquerias and bizarre food challenges seems to take over but, yeah, we'll give that spot another go ahead. 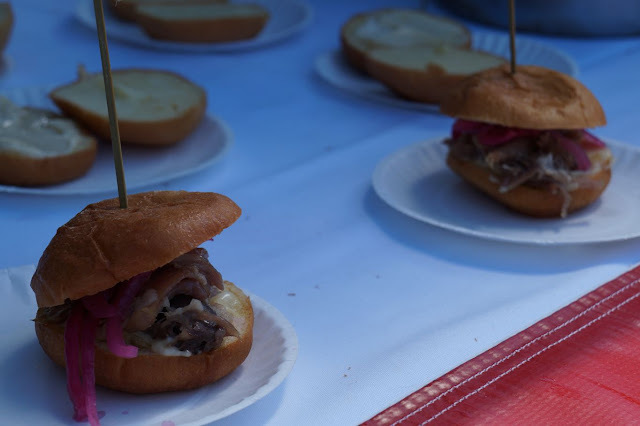 On this day though, our second foray into the world of sliders consisted of duck confit with an apple dijonnaise and pickled onions. These guys were rad. Unctuous with a brightness from the onions and a bite from the creamy spread. So far this was our favorite nibble. 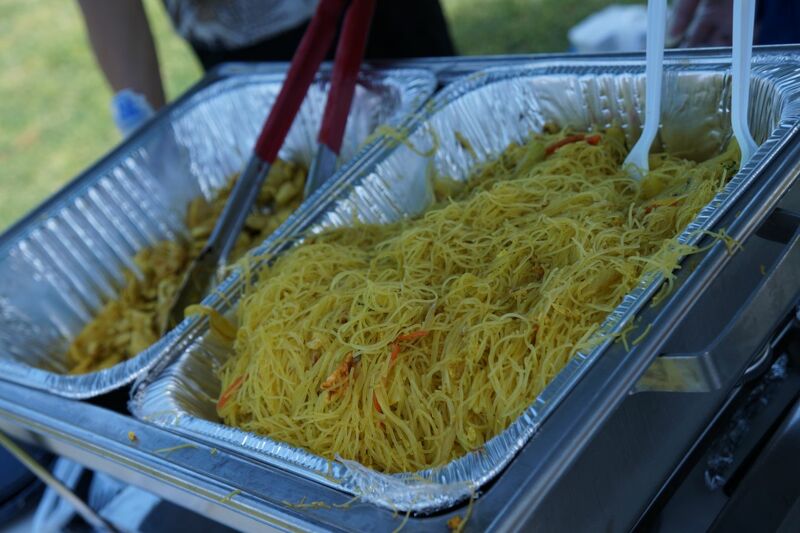 But there were so many more food tents to travel to! "You work for the event? 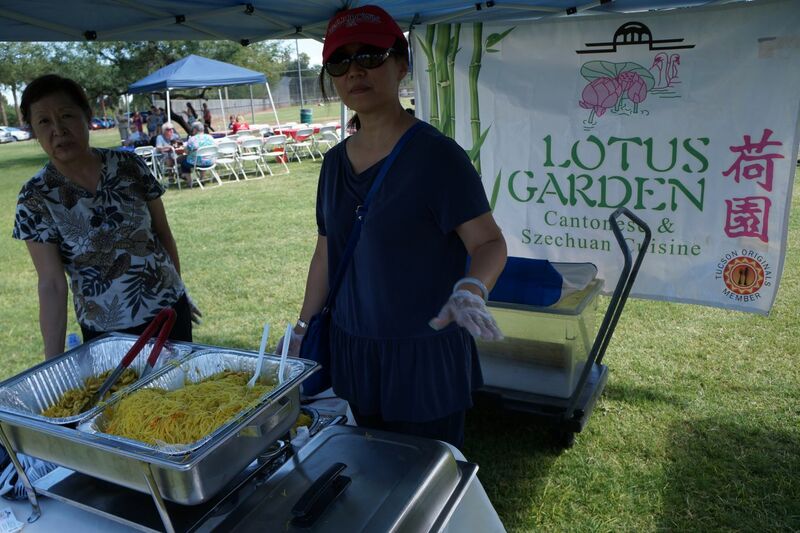 ", asked one of the ladies from Lotus Garden. I guess she saw our "fancy" camera and us taking photos of all of the food and assumed that we were with Tucson Originals or volunteers for the event. Not sure if that was an answer to satisfy them enough but they loaded us up with a plate that nearly toppled with Asian curried noodle goodness. "Is that enough chicken? You want some more?" They smiled bright as they continued to pile on the glistening yellow, succulent bites. We thanked them then headed off to a shady spot to enjoy and actual "plate" of food rather than a modest sampling. Well thank you nice ladies of Lotus Garden! The noodles were awesome, the chicken was juicy and the mild curry you bathed it all in just made our mouths happily sloppy with Szechuan delight. After this load we were starting to hit the food wall. But we were only halfway through our rounds. We drove by Eclectic Cafe once on our way to some party and we were all "Oh, there's that place! We need to go there someday." Like most other promises to ourselves, that one just kind of fell to the whims of our full time jobs, other endeavors and getting pulled this way and that with various food adventures. 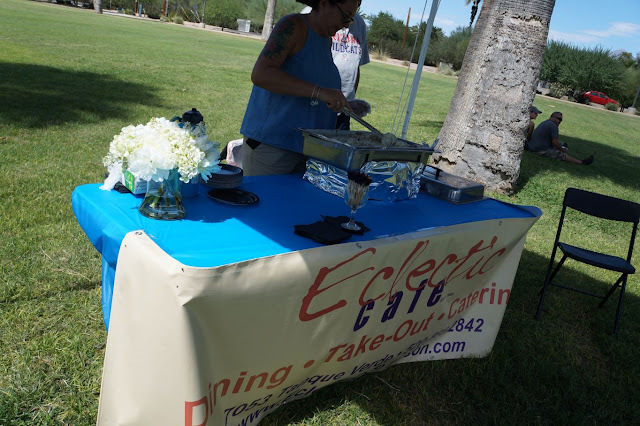 So when we arrived at their tent we admitted to them that we had always meant to visit their restaurant on Tanque Verde but had yet to. They seemed okay with it. 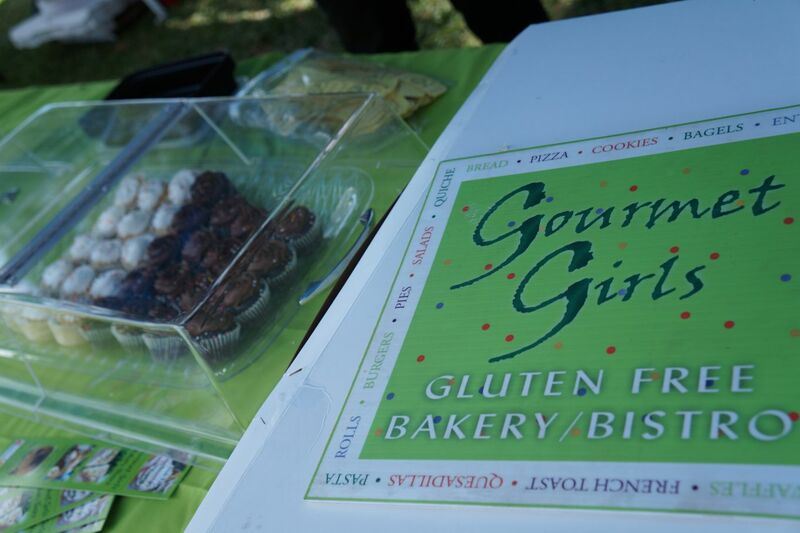 Thing is, we tend to stay away from "gluten free" eateries just because, well...just because. 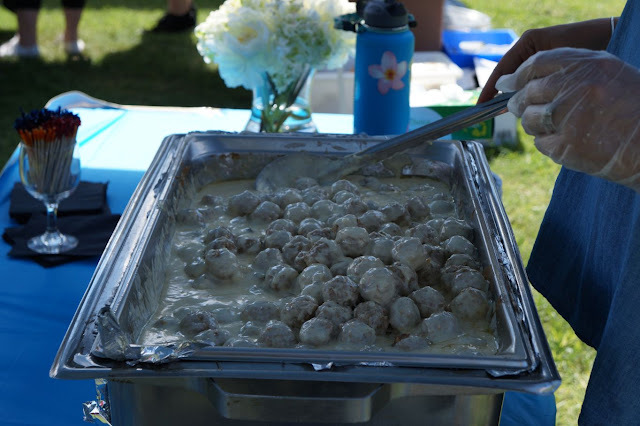 But after trying their take on Swedish meatballs we might have to make the journey to Eclectic seeing as their food is, well, eclectic and isn't just focused on being "gluten free", although they do have that option for a lot of their dishes. For that we salute eateries that can accommodate those few that actually suffer from celiac, while other insist that gluten makes their tummy "all gurgly", but the nice folks at Eclectic made us change our minds about buzz word, bandwagon restaurants. Not that we are cataloging Eclectic Cafe into that genre, far from it. It's just....you know what we mean, right? Anyway, the meatballs were good. Now this is a place we can get down with, mainly because it is just a few blocks from our compound. Pastiche is a go-to for us, and has been for a while, mainly because their three cheese mac-n-cheese dish with spinach and bacon is totally addicting. Sure they have a multitude of amazing menu items, but if you've ever had their take on the kid friendly macaroni favorite, you know what we are talking about here. 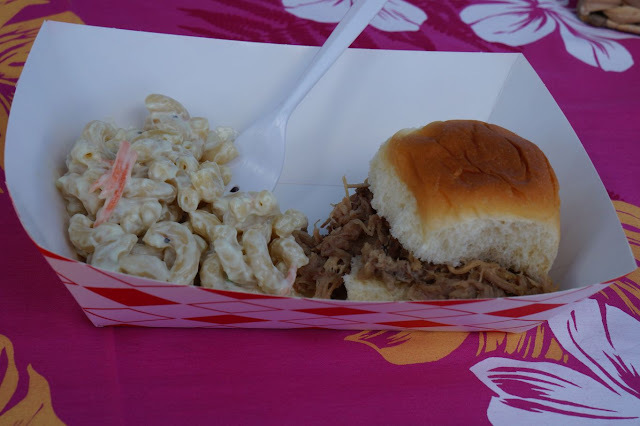 No luck with getting a taste of their mac-n-cheese, rather for this occasion, they served up (yep...you guessed it) sliders! 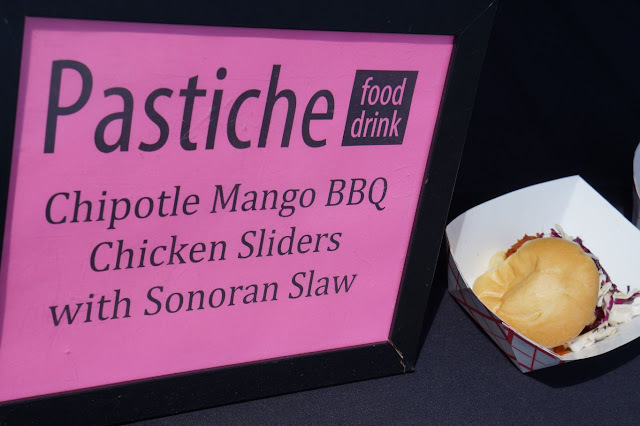 These though, just like the others, were really delicious and extremely different from the last few we tried. 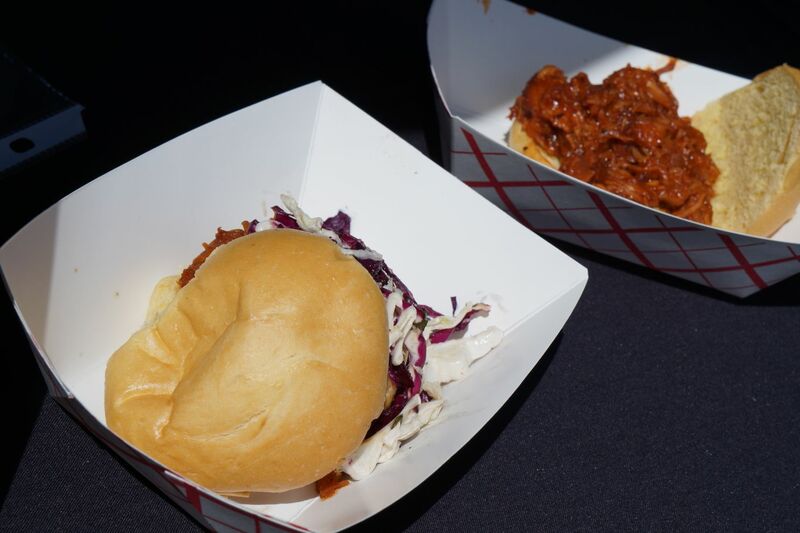 They were slow cooked and pulled chicken in a sweet and spicy chipotle mango BBQ sauce and finished with a creamy and crunchy southwest slaw. All of the elements worked brilliantly but when we asked why they didn't make a ton of their mac-n-cheese they just gave us a "really?" look and told us how labor intensive that dish was. A labor of love though. Lots of love goes into their mac-n-cheese. We loved these sliders too. Our final slider came courtesy of Mama's Hawaiian Bar-B-Cue and we were happy to move on from the mini sandwich bite item. Luckily for us Mama's did us right with a good n' sticky pulled pork offering on a sweet King's bun. Really yummy. 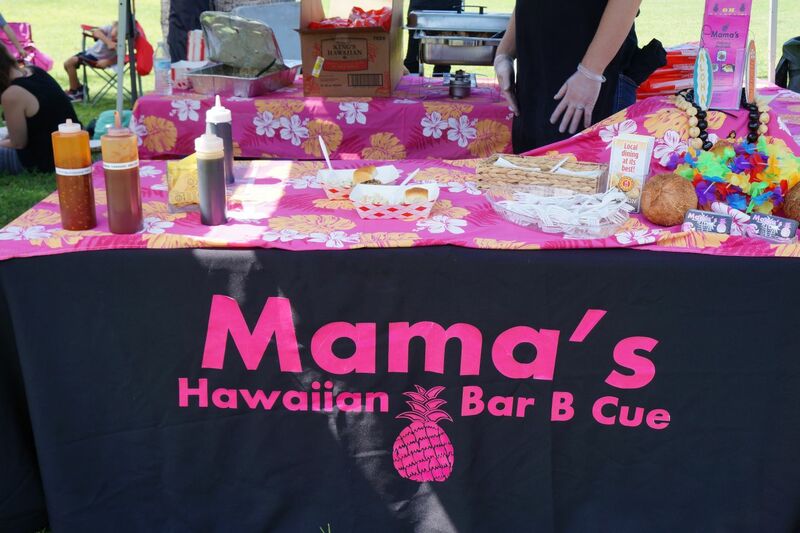 But what grabbed us was the tang and zazz that came from the side item, their macaroni salad. Was it because we were craving mac-n-cheese that made this accessory so good or was it, well...good? It was good. Velvety and on point without deviating from what grandma might make for the church picnic. We wanted more but seeing as the event was drawing to a close and they were running low with more folks waiting in line to try it, we had to move on with our greedy shoulders hanging a bit low. Good thing the macaroni salad is on their regular menu because next time we are in there you better bet we are getting that noise as a side item. Macaroni salad. Who woulda thought? Now we've had Gourmet Girls before, just never at Gourmet Girls. Again, its that gluten free dealy. Thing is they make some of the most decadent and delicious confections and desserts ever and we can't wrap our meat and booze addled minds around how they do it doing what they do. But they do! And they do it well. We treated our next to last stop as a well earned palate cleanser; a sweet bite before heading off into the pre-dusk glory of a most delightful day. 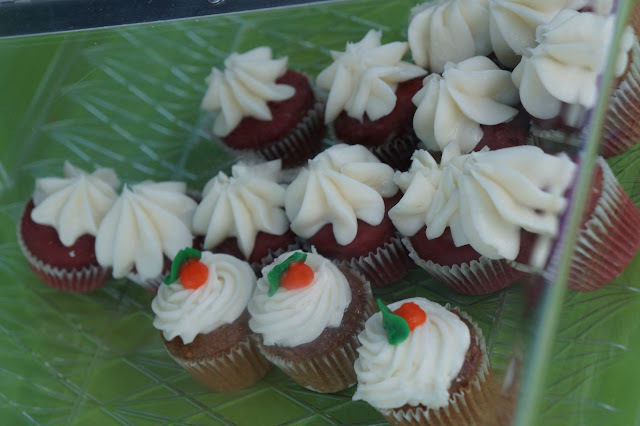 Mini carrot cake and chocolate muffins kissed our slider ridden tongues and nipped our well sodden bellies with a sugary tickle. How they concoct such loveliness skirting certain necessary routes to achieve blissful cupcakery, we don't know. Honestly, we don't want to know. And just like our preconceived bias of other gluten free establishments, we plan on dining at Gourmet Girls in the near future. Wait...how is this gluten free? It was really cool to end a fun food day on a familiar note. 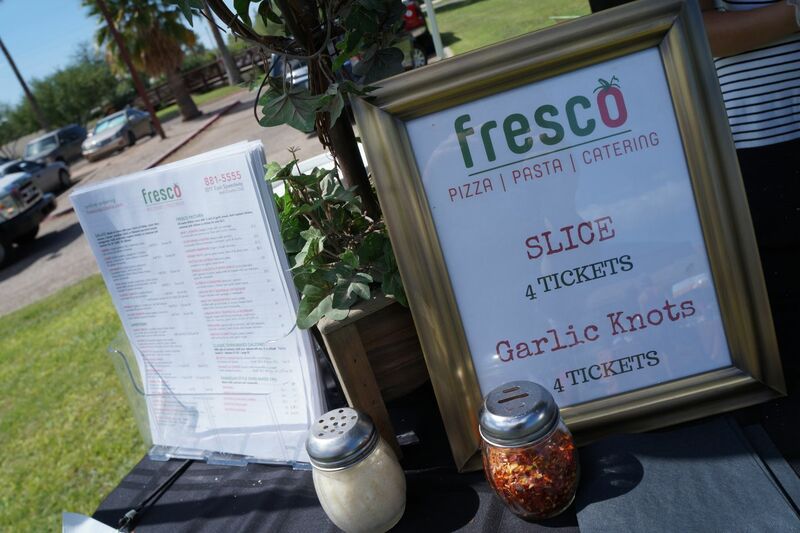 Many cheesy days and beer soaked nights are in thanks to the good people at Fresco Pizza. Just the fact that you can walk in and order a "Major Meaty" has always been a high point in our eating career. We ate their truffle oil and rosemary linguine cold in the morning on day. And you know what? It was scrumptious. Scrumptious we say! Sluggish and ready for a well deserved liquid digestive, we grinned like a stuffed Cheshire Cat when we eyed their ample supply of garlic knots. Long gone were the pizzas, and we were okay with that. We were full. But the knots. Oh the knots! Charged with an ample amount of fresh chopped garlic, these little nuggets of puffed out devilry only made us collide even further into a near hallucinatory state of food buggery. "You sure you didn't bring any beer from your place," we asked owner Britnee Cable. "Because you have Dragoon IPA on tap and that would be amazing right now." She smiled and assured us no. No she did not bring any beer. But rather she apologized for running out of pizza. "That's okay. It's time for a food nap. Thanks anyway." With that we headed out, back to the car, sitting there in a near food catatonic state only to just fall asleep and wake up to a nice little girl asking us if we wanted some lemonade. 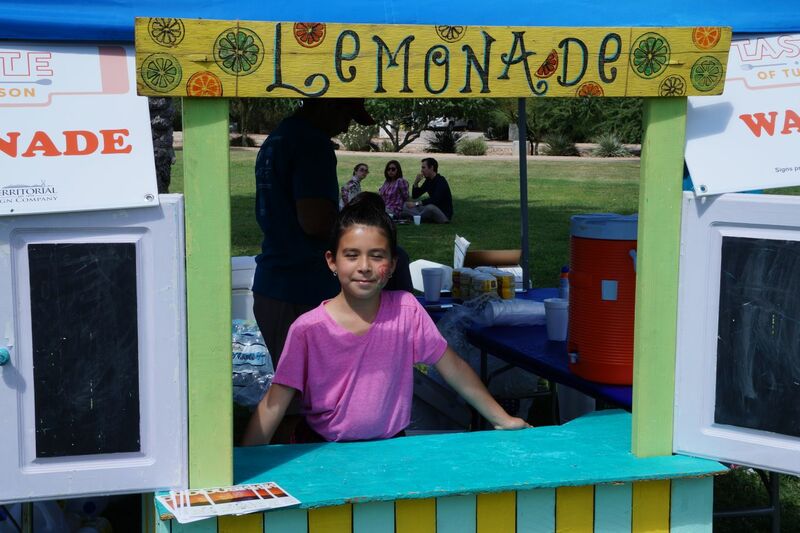 We would love some lemonade, we said to the smiling girl. And you know what? Thank you Tucson Originals! And thank you to all participating restaurants in this year's Taste of Tucson. "We Are In This Business To Make People Happy"
"A Dumpster Fire Wrapped in a Tortilla"